This is an itchy skin condition that is caused by a tiny burrowing mite called Sarcoptes scabiei. Due to the presence of this mite, an individual experiences intense itching in the area of the burrows and finds the urge to scratch often. The urge may be more so at night. Scabies is infectious and can spread very quickly through any close physical contact. These mites are microscopic and are attracted to the warmth and smell of humans. Who is at risk? The following groups of people are at a higher risk of exposure to scabies mites: • Sexual contact is the most common form of transmission among young people. • Individuals who live or work in institutions such as nursing homes, prisons, and homes for the developmentally disabled. • People who live in crowded places. • People who have a compromised immune system as in HIV patients and those who are unable to communicate about their physical symptoms are at a risk of severe scabies that can be difficult to treat. What are the signs and symptoms of scabies? • Itching that is often severe and generally worse at night. • Thin, irregular burrow tracks that are made up of tiny blisters or bumps on one's skin. These burrows typically appear in the folds of one's skin. 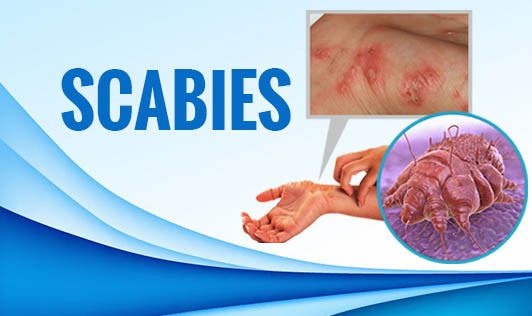 In adults, scabies is often found between fingers, armpits, inner elbow, soles of the feet, around breasts, knees, shoulder blades and along the sides of the wrists. In children, its most often found on the scalp, face, neck, soles of the feet, and palms of the hands. Prevention Here are few suggestions to help you prevent re-infestation and stop these mites from spreading to other people: • Clean all your clothes and linen regularly. Use hot water and soap to wash all clothing. Avoid using the same towel for several days. Change your bed spreads often. Dry all clothing with high heat and, dry clean items that you cannot wash at home. • Starve the mites. Place items that you cannot wash in a sealed plastic bag and leave it out of the way such as in the garage. Mites die if they don't eat for a week. The treatment for scabies includes oral and topical scabicidal drugs. Contact your doctor if you or your family member has any signs or symptoms of scabies.